I’ve been an X-Men fan for over 20 years, but I’ve never found a perfect reading order for X-Men comic books – so I decided to build one myself! I examined every X-Men title ever published and put them in reading order. My approach is a little different than other guides. I don’t slave over inserting single issues between one another or even switching mid-issue. I take things one story at a time – so you can read without switching comics mid-story. 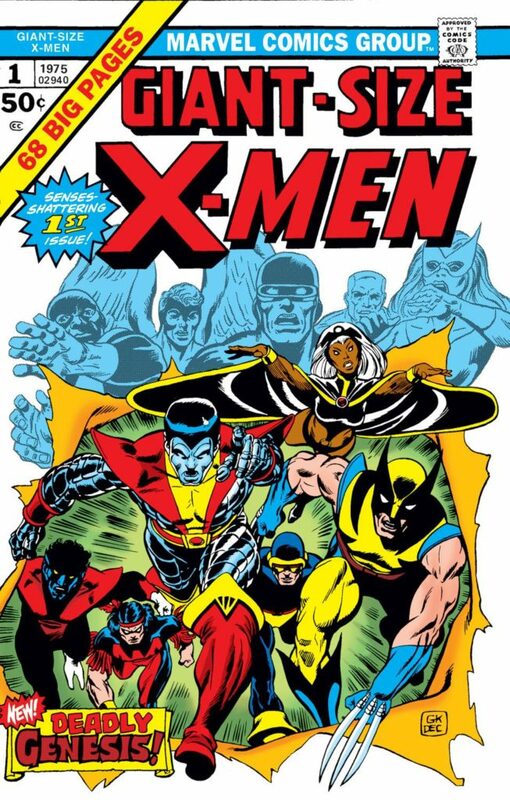 This X-Men reading order guide takes advantage of the breaks in stories created by Marvel’s collected editions wherever possible and was built by referencing release dates, chronology guides, and Marvel’s own Official Indexes. The result? An easy-to-follow guide that threads all X-Men titles together like one massive crossover. Is a comprehensive X-Men reading order more than you were looking for? For a trade reading order guide to any single X-Men title, like Uncanny X-Men or Wolverine, head to the Crushing Comics main page! Or, try Instant X-Pert, which only include stories that were the highlights of 50 years of X-Men comics. How does the reading order work? Click one of the Eras below based on the period you’re interested in or the dates your comics were originally released. Stories occurring prior or parallel to X-Men #1 in September 1963 – as well as “Origins” and “Before the X-Men” types of series. Uncanny X-Men #308 in January 1994 to Uncanny X-Men #337 in October 1996. Uncanny X-Men #338 in November 1996 to Uncanny X-Men #365 February 1999. Uncanny X-Men #362 in December 1998 to Uncanny X-Men #393 in June 2001. Uncanny X-Men #394 and New X-Men #114 in July 2001 to Uncanny X-Men #443 in June 2004. Uncanny X-Men #444 in July 2004 to Uncanny X-Men #465 in December 2005. This begins with the immediately post-Morrison period and concludes with House of M.
Uncanny X-Men #466 in January 2006 to Uncanny X-Men #491 in December 2007. It includes the events Decimation, Civil War, and World War Hulk. Uncanny X-Men #495 in April 2008 to Uncanny X-Men #525 in August 2010, which spans Messiah Complex to Second Coming. It includes the events includes Secret Invasion, Dark Reign, and Siege. Uncanny X-Men #526 in September 2010 to Uncanny X-Men, Vol. 2 #20 in October 2012, including all of Fear Itself and Avengers vs. X-Men. Stories starting from the launch of All-New X-Men as a part of Marvel Now! in October 2012 to the end of Secret Wars in 2015. Stories starting after Secret Wars in late 2015 to the resolution of Inhumans vs. X-Men in early 2017. Starts starting with X-Men Prime in 2017 through an ending point TBA. Hi. I’m interested in getting into the X-Men but I don’t know where to start. I’m a fan of Astonishing X-Men but not so much the 60s & 70s X-Men, the overly cheesy era. If anybody could make any suggestions that would be great. Thanks! Timothy, a lot of Astonishing fans would either hop backwards to the immediately preceding Grant Morrison New X-Men or move forward to the next chronological story, Messiah Complex. Hi, first of all, great work! Your X-men Guide is fabulous. I wonder if you’ll continue your guide after Era #15, since 2016 marks a new beginning to the marvel comics. I hope so. Frank, I continue to debate if I’m going to continue the Reading Order. I have a lot of that next period mapped out, but it would take a TON of time to re-read it as I put it together and right now I’d love to spend that time on making new character guides. I may wind up making this a stretch goal for my Patreon campaign. Hi, first of all great work on the site and the guide. I just started reading Uncanny X-Force by Rick Remender and love it. Its just that I dont know where to go back to start. People recommended this but ive been seeing other recommendations. Mark, comics fans are crazy people who would tell you to read forward from X-Men #1 in 1963 if you have the time, and that includes me. I’ve got an article called “Where to Start Reading X-Men” that suggests start points across multiple series. That said, I don’t always think it’s worthwhile to cast back years and years to find a perfect start point when you’re enjoying current material – sometimes it’s best to hopskotch backward a chunk at a time. From that perspective, one major hop back from UXF is Messiah Complex. However, here’s the honest truth about Uncanny X-Force: It reads just fine on it’s own, but it doesn’t really hurt to have read X-Force, Vol. 3 (for background on Angel’s recent history) or the Weapon X arc of New X-Men (for background on Fantomex). I don’t really understand that list, as it’s a mix of single series and events and has at least one thing out of order. Happy to provide some clarification on a more specific question about how to use it. Hi. I want to say thank you for this list. I have honestly read almost a great deal of comics and love having a good system for it. I do have to ask though. When will era 15 be ready? I’m pretty much reading up to date on new books but I have no clue what I’m missing from that missing era. I do so hope you finish that one. There’s a lot of books in there and don’t want to miss a single one. Thank you again for all your hard work. I can’t even imagine how you went about this. While I know it’s nowhere near as concise or aesthetically pleasing as your lists, I went ahead and compiled my own orders for what would be “15 – Yesterday’s X-Men” and what I would call “16 – All New All Different X-Men”, 16 is still very much a work in progress as it would be Secret Wars until now, which doesn’t leave room for much more than 10-11 months of comics. That said, for anyone interested, my list for “15” is below. This goes from the end of “Era #15”, or the end of AvX, directly into Secret Wars. I cannot guarantee this is complete, it has been culled from a variety of sources, but the majority of the initial ordering came from http://comicbinding.com/mapping/complete-x-men-volumes-88-100-the-new-revolution with some heavy modifications by myself as warranted while reading. I literally read this every day. Amazing works! I want to get into X-men comics. I have uncanny X-men all 544 issues for an ebook. What comes after that. Can someone please list me everything in order and include spin-offs and just everything in chronological order. I have been googling this all day and I can’t find a complete guide to start from the beginning and just read every single issue and spin-offs in chronological order. I’d really appreciate it. Jenners, it sounds as though you are in the right place – because I’ve looked for that exact thing in the past, and it’s how I wound up writing this guide! If you follow the Eras in this guide, it’s exactly what you describe: a complete guide to start from the beginning and read every single issue in chronological order. Let me know if you have specific questions! Hey Peter! I was wondering when you plan on updating this guide to include the newer eras on X-Men. I’ve made my through Era #4 now and am looking to get some of the recently released TPB and OHC but I have no clue what I’m doing. No pressure, just wondering. Hi Krisis. Just wanted to let you know how much I appreciate you taking the time yo make this guide. I’ve been watching your Crushing Comics series on Youtube. What a great idea foe a video series!! Thanks again! I’m planning to read all the X-Men and supportive titles I can get my hands on from 1963 to 2001. My only confuses went to read X-Men 2099. Please tell me when to read them and don’t say they can we were at anytime. I need to read him sometime and somebody has to tell me when. And Kudos on a great list it’s really got me back in X-Men. I’m rereading my X-Men Comics based on this guide. The only thing I don’t knows when I read X-Men 2099. Please don’t say any time but give me an idea when I should read them. Thank you and great list! X-Men 2099 has nothing to do with the main timeline of X-Men – it’s not even strongly connected to the future timelines of Cable, Rachel Summers, et al. Spider-Man 2099 is one of the only 2099 characters to spend significant story time in the main 616 Universe – and even that came much later in his existence as a character. 2099: World of Tomorrow (1996) #8 out just before Operation: Zero Tolerance). There is a character who eventually turns up a few years later in X-Force #91-92, so you should finish all of your 2099 reading by then. I’m also looking forward to era #15! Best regards and keep up the awesome work!